I was recently asked to lead a day’s training session on developing a family law practice for firms in the LawNet group http://www.lawnet.co.uk/. Sarah Scott, a partner in the family team at Oxley & Coward http://www.oxcow.co.uk/, provided a short presentation on their experiences with media relations and social media and was kind enough to let me prepare a short case study. The firm provides a blend of commercial and personal legal services, has a Legal Aid contract for crime and family and comprises nine partner and 75 staff in an office in Rotherham. Sarah summarised their strategy as follows “First, we aim to maximise our public law work through membership of the Children Panel, networking with referrers and offering advocacy services (where their clients regard them as “Court Hearing Heroes”. Second, in the private law area we have payment options such as Pay As You Go, monthly instalment plans and tailored fixed costs for divorce. The PAYG service empowers the clients to handle their own case and deal with all the administration. Third, we aim to excel at what remains of private law Legal Aid by offering drop in services at our local domestic abuse support service and attending the domestic abuse forum. Fourth, we offer collaborative family law services”. The Pay As You Go service is interesting as clients pay for face-to-face advice only, payment is made at the end of the meeting and there are no hidden charges. 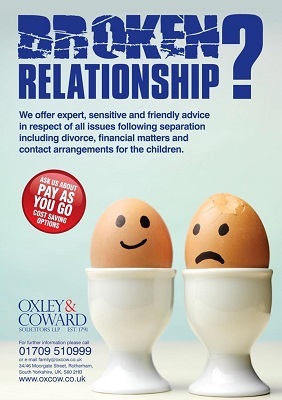 The fixed fees divorce covers an agreed consent order and there is also fixed fee advocacy available. In terms of marketing, brand awareness is promoted through social media – both LinkedIn and Twitter (@OxcowFamilyLaw has 400 followers and Sarah also operates her own account @SarahLScott) are used. They also produce press releases and posters (“Don’t suffer in silence” for domestic abuse and “Every child deserves to be happy” for the specialist child care team). Looking forward, Sarah says “We plan to rebrand our Twitter page, post more content on LinkedIn, create a presence on Facebook and update our web site”.